Austin Theriault celebrates his first win of the 2017 season at Daytona International Speedway. 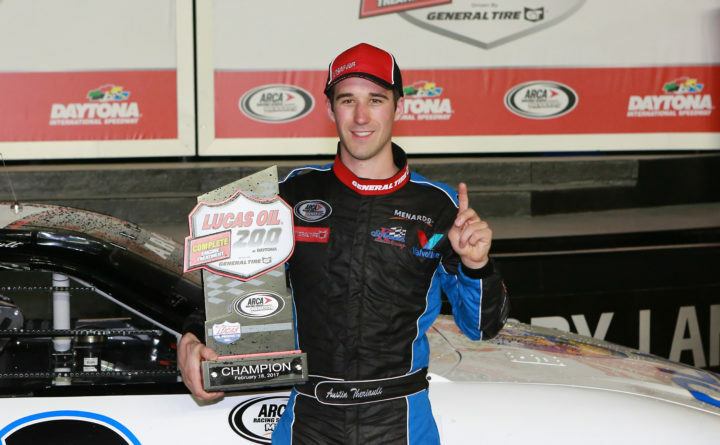 Fort Kent native Austin Theriault said Tuesday he is close to finalizing a deal that would enable him to make his debut in a Monster Energy NASCAR Cup Series race this season or next year. Theriault has been working closely with Old Orchard Beach native Archie St. Hilaire, owner of the Go FAS Racing Monster Energy Cup No. 32 Ford Mustang, to put together a two- or three-race deal. St. Hilaire already has a full-time driver for his No. 32 in Corey LaJoie, son of former longtime racer and two-time Xfinity Series points champion Randy LaJoie. St. Hilaire could, however, run a second car on a part-time basis or he could work an alliance with another team to put Theriault in a Cup car. LaJoie is 29th in the Monster Energy Cup point standings. Theriault drove for St. Hilaire at New Hampshire Motor Speedway in the K & N Pro Series East, formerly Busch North, as part of the Mainely Motorsports Young Guns competition in 2012. Theriault will return to the NASCAR Gander Outdoors Truck Series on Saturday with Ricky Benton Racing Enterprises. He has a multi-race deal with the team but failed to qualify by fractions of a second last month for the NextERA 250 at Daytona International Speedway. Theriault said since they are doing just a handful of races, they weren’t eligible to earn a provisional spot in the race so they had to qualify on time. “There were other teams that posted slower times than ours, but they had provisionals because they were either running full time or had provisionals that carried over from previous seasons,” Theriault said. Theriault will make the transition from the 2.5-mile superspeedway at Daytona to the congested half-mile at Martinsville Speedway in Martinsville, Virginia, for the Martinsville 250 at 2 p.m. Saturday. The race will be televised by Fox. He will be driving a new truck he hasn’t driven before and the setup for it will be much different than the truck he drove at Daytona. He said drivers can put friendships at risk at Martinsville because of the contact involved. “You have to make enemies to get up through the pack. You have to lean on your competitors. It’s always a lot of fun,” Theriault said. They are two practice sessions Friday before qualifying and racing Saturday. “First, we have to qualify and then we have to finish the race in one piece. That would allow us to get to the next race we’re running,” Theriault said. That would be the North Carolina Education Lottery 200 on May 17 at Charlotte Motor Speedway in Concord, North Carolina.